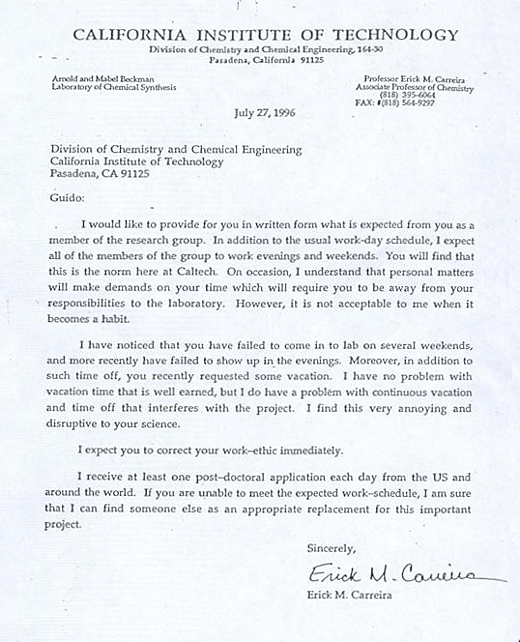 Written in 1996, below is a sternly-worded letter from a CalTech chemist — Erick Carreira — to a member of his research team — Guido Koch — in which the former reprimands Koch's supposedly slack work schedule following his absence in the lab on numerous evenings and weekends. Also unacceptable to Carreira was Koch's gutsy request to take a vacation. 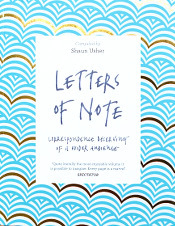 The now infamous letter was featured on Chemistry Blog last June (2010), very quickly caused an internet-based commotion, and engendered much discussion about the treatment of post-docs. Carreira responded to the delayed uproar in an interview with the Boston Globe. Transcript follows. Image courtesy of Chemistry Blog. 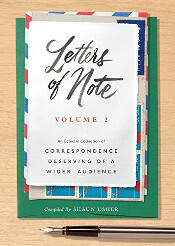 I would like to provide for you in written form what is expected from you as a member of the research group. In addition to the usual work-day schedule, I expect all of the members of the group to work evenings and weekends. You will find that this is the norm here at Caltech. On occasion, I understand that personal matters will make demands on your time which will require you to be away from your responsibilities to the laboratory. However, it is not acceptable to me when it becomes a habit. I have noticed that you have failed to come in to lab on several weekends, and more recently have failed to show up in the evenings. Moreover, in addition to such time off, you recently requested some vacation. I have no problem with vacation time that is well earned, but I do have a problem with continuous vacation and time off that interferes with the project. I find this very annoying and disruptive to your science. I expect you to correct your work-ethic immediately. I receive at least one post-doctoral application each day from the US and around the world. If you are unable to meet the expected work-schedule, I am sure that I can find someone else as an appropriate replacement for this important project.